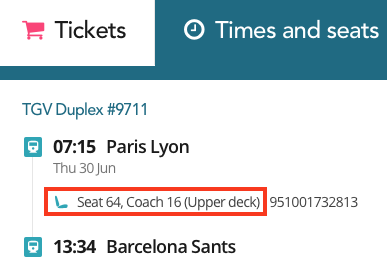 The rail operator currently doesn't allow us the functionality to choose seats, or offer the preference for Upper or Lower Deck reservations on the TGV Duplex between Paris and Barcelona. However, you can see the seats you've been assigned before you make payment (seats 61 and over are Upper Deck). All seat numbers 61 and above are in the upper deck on TGV Duplex trains. You can view which specific seats you have been allocated on the TGV Duplex seating plan. The words "Salle haute" indicate the upper deck, while "Salle basse" refers to the lower deck. Please note that the seating plan is provided by SNCF and Loco2 cannot be held responsible if your reserved seats do not correspond to the plan. If you are not happy with your assigned seats, you can add one or two more tickets to your basket and choose the seats you prefer - just make sure to delete any unwanted tickets before completing your order.